2012 Legacy? New places, new people, new projects…new website! The Olympics officially get underway today, and ‘legacy for 2012’ is what we are discussing in our post today. 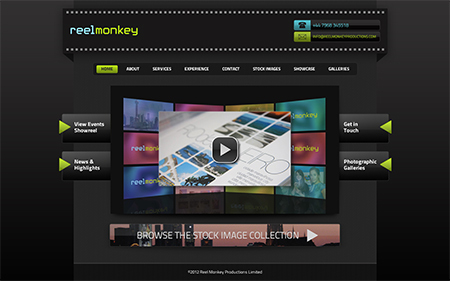 The year 2012 so far has seen Reel Monkey Productions travel to new places for shoots, meet new people, undertake new types of projects (a podcast for an app for mobile phones and devices was recently completed) and now…a revamp and rebuild of our website thanks to the design gurus of Monio Design. All a lasting legacy we hope we can build on. The new website now has a video showreel summarising our key services, entitled ‘visual communications for a digital age’ which sits on the homepage. Click on the screengrab below to view the video on our homepage. We are now hosting our image galleries under one roof and integrated our travel and sporting stock image search facility within our site. Visitors can now browse, licence and download our images instantly through the site. Our video production work and our photographic imagery at events can help to create memorable tools for businesses looking to record and capture special moments and communicate effectively with their audiences. Get in touch and let us know what you’re working on and we would be happy to help create your legacy.